If you are a Living History buff, Newport House Bed & Breakfast is the only choice for your Williamsburg visit. We invite great questions, and we love an evening filled with interesting conversation. Living History, it’s a phrase you may not be familiar with. In the world of reenacting, there are often two groups: there are weekend hobbyists who enjoy an afternoon mixing with friends; and there is a group of history students. These folks are often professionals in the field and portray real, historic characters with frightening accuracy. Many are surprised to learn that College Professors often consult this group for practical information when conducting research. Can you really use a sewing needle made from bone? 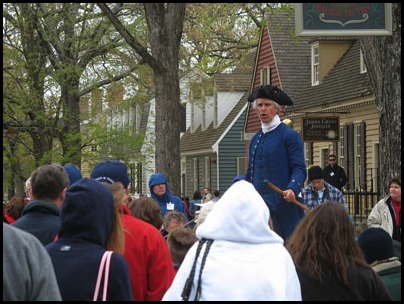 You will be fortunate enough to meet several professional reenactors during your visit to Williamsburg. They take their jobs very seriously and you should take a moment to speak with them. These amazing people will know what happened on this exact date, in real life in the town, farm or battlefield they are portraying. They have read dairies and know exactly what the person they portray thought about what was happening around them. It’s always entertaining for serious reenactors to watch the faces of tourist as it slowly occurs to them that what they are hearing is completely authentic. You should watch the tourist too, most will politely listen, not get it, and move along to the next person in funny clothing, a few will start asking increaslying obscure questions, and the game is on. They become more and more impressed as they discover the world of living history. These are the folks we love.